Today was the most beautiful and sunny day that I can remember in a long time and it is hard to believe that we could have such a warm day during winter. This weather makes me feel happier and much more positive about life. It is usually around this time of year that I start to feel excited about the commencemet of springtime. 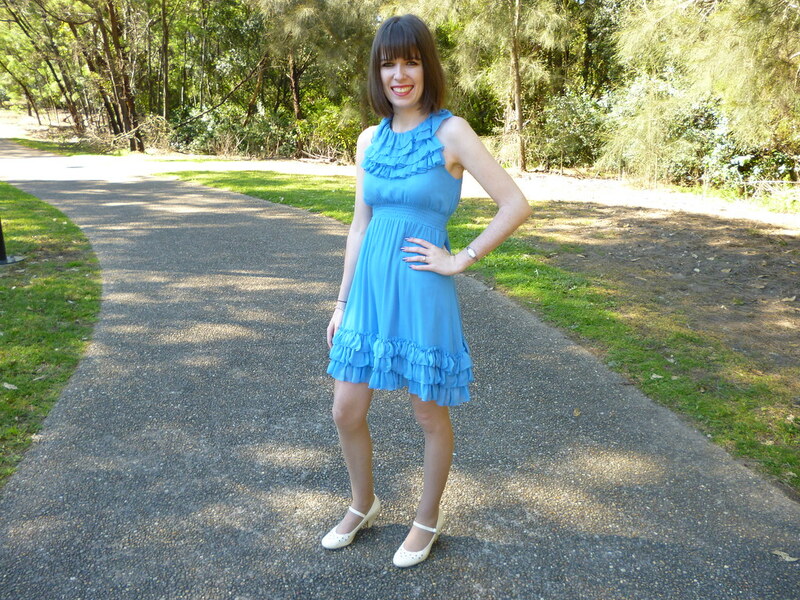 In contrast to what I said the other day about the difficulty of taking outfit pictures during winter, today was the perfect conditions for photos- clear blue skies, no wind and a bright colour block dress. This dress is my most recent purchase and my last for a very long time since Rydog and I are seriously saving for the future now. I bought it from the children’s section of Leona Edmiston and I feel so lucky to have found it. I love the ruffles especially since it is often hard to find a dress with this detailing. I also adore the colour. It is a unique colour and it really stands out. I also like the fact that it is blue because for some reason blue (other than navy) is unintentionally the most uncommon colour in my wardrobe. The modcloth vintage inspired heels are one of the best purchases I have ever made. They were a bargain price and are very comfortable and perfect! They are definitely my most worn shoes. I wish they hadn’t sold out on modcloth so I could buy another pair when they completely wear out. 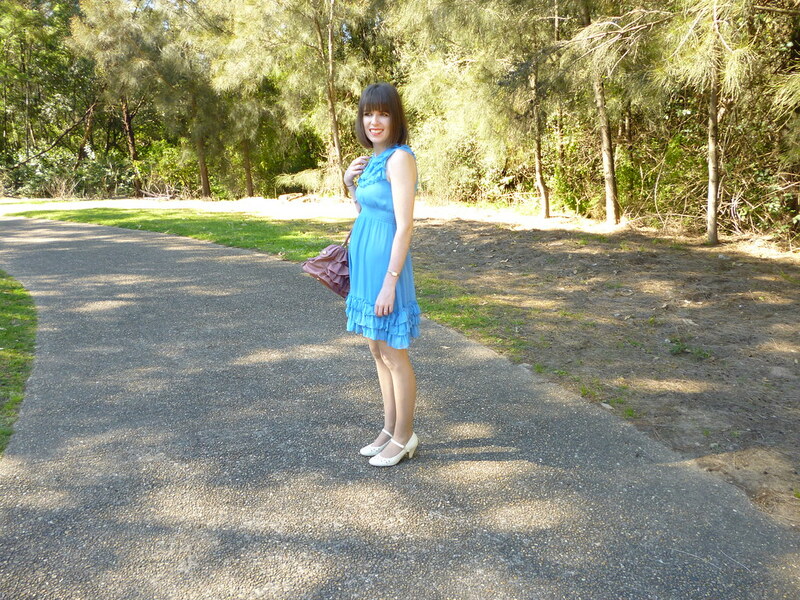 This entry was posted in Forever New, Modcloth, Outfits. Bookmark the permalink. I just loveeee your hair style. You look so sophisticated and glam! And I love how you pair your ruffle dress with the ruffle bag. Too much ruffles could be a miss, but you managed to style your outfit so well! Love it! pretty girl, I love that blue on you! It's such a pretty look. Absolutely love the colour of the dress and the ruffles. Your dress is lovely and bright. Glad youve been having some sunny skies too, yay for spring weather 🙂 I do love those shoes too. You have the best hair. I'm sure that it is difficult to maintain, but it looks cute! I also love this color on you. You should wear more of it! The color looks great on you. You look sooo beautiful in that color…buggar about having to save isn't it…maybe haunt those local op shops for some bargains. ps roll on spring I say! Love that dress — the color is awesome, and the ruffles are so cute. what a pretty color of blue! its winter where you are??? wow it is so hot over here lol. thanls for your comment, you are darling! That dress is awesome! I like the color! And I like the ruffled bag too! That dress looks SO cute on you! 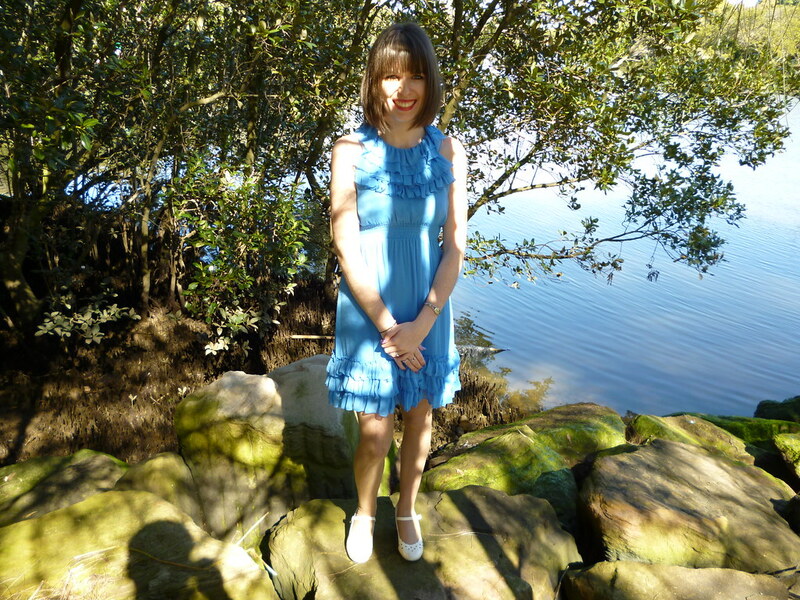 your dress is really lovely, i like its colour and the ruffles! what a beautiful outfit! you look stunning! This outfit is so pretty! 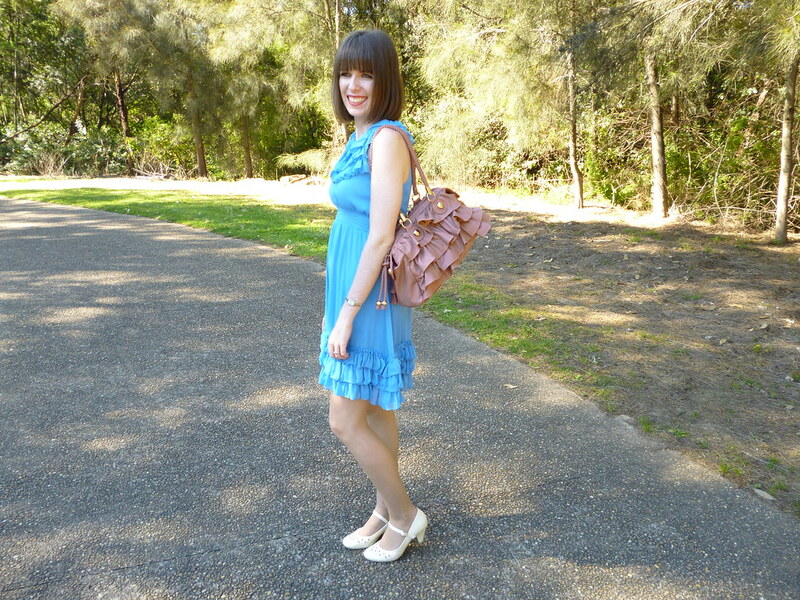 I love the ruffles in the dress and the bag! 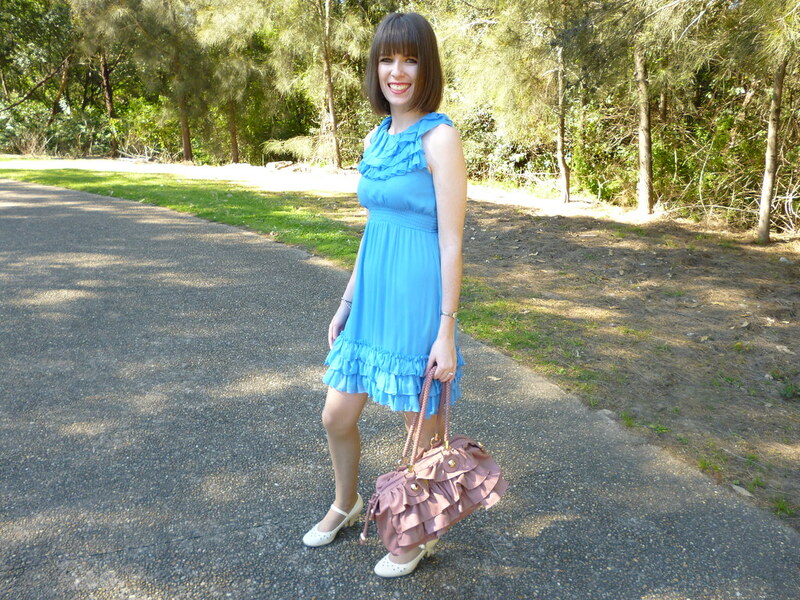 I love all the ruffles and the colour of your Miss Leona Ruffle Dress. The fabric, the waist, and the way it hangs all look very pretty as do you and the scenery in photos of this post. The photo by the water is especially pretty. To me it looks like there could be the slightest trace of turquoise in that blue dress. It would contrast beautifully with the fuchsias and hot pinks I am so fond of and it looks nice with your Forever New Ruffle Bag which I like as well. They look very feminine and stylish. Thank you so much for my birthday wishes! Lovely outfit, the dress is amazing! !